Students practice reading and writing color words with these differentiated flip strips. Includes three levels to accommodate your students’ writing abilities. This word work is great for independent work task boxes for special education classrooms. The repetition will help your students learn the task quickly: read – write – flip – repeat. Can also be used as a portable word wall or flashcards. 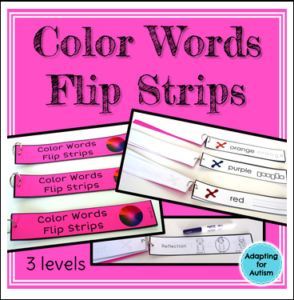 This is a small part of my Flip Strips BUNDLE which also includes 322 sight words, 60 CVC words and 12 shape words.